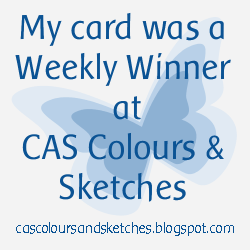 This is my last week to play along with the team at CAS Colours & Sketches as their Guest Designer for the month of November. I rotated the sketch 90 degrees counter clockwise and changed the orientation. The result is my card that I made to look like a rustic and festive gift. Super idea for using the sketch, love your kraft gift box. Thanks for being an amazing Guest Designer at CC&S. Great creative use of the sketch! Thanks again for joining us as a guest designer this month - you're cards have been wonderful! Over the present that you put together for this week. The big red ribbon is so fun!! What a great bow, this is wonderful Joyce!! Congrats on your Guest Designer spot, Joyce! I love how you paired rustic and festive with your design and color combo...so fabulous! Loving all the texture on the ribbon and bow, too! Such a fun card! I love red and kraft together and you've made a perfect gift with them, Joyce.